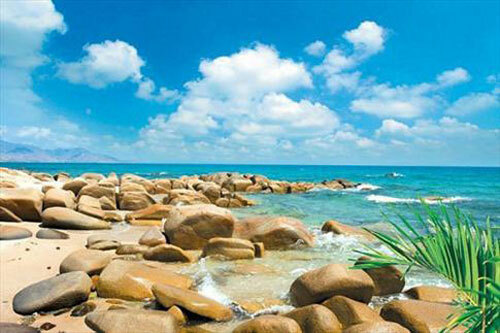 This beach is located near the First highway and is 32km away from Phan Rang Borough. This place is one of the most attractive tourism destinations in Vietnam with a combination of many types of tourism such as ecotourism, cultural tourism and food tourism. The scenery in Ca Na is magnificent with the clean, blue sea, covered by the white sandbank and the mountains at the back. The atmosphere in Ca Na is also fresh and cool that makes the visitors feel comfortable and refreshed. Furthermore, the night-time on this beach is awesome, especially when there is moonlight. The sound of the wind and waves are mixed to become a harmonic song that cannot be forgotten. Ca Na is also fascinating with its cultural attractions. A large number of Cham people still live here, and they still preserve many traditional elements of their culture. Therefore, visitors can learn more about the history of Champa Kingdom and understand more about the culture of Cham people in Vietnam. Moreover, the beach is a paradise of seafood with diverse kinds of fresh and tasty species; hence, travelers have the chance to taste the dishes that they might have never eaten before, which makes this place even more unforgettable.